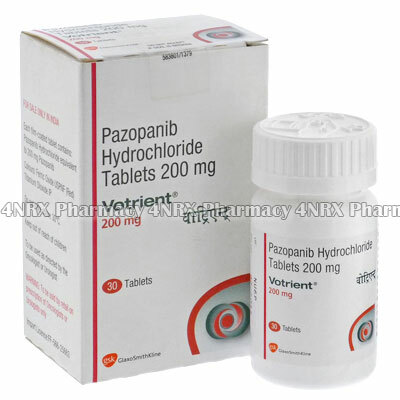 What is Votrient (Pazopanib) used for? How should I use Votrient (Pazopanib)? Recommended dosages are as follows. These are guidelines only. Follow the instructions given to you by your doctor. Votrient tablets should be swallowed whole with a glass of water. Take the tablets on an empty stomach (at least one hour before or two hours after a meal). Hepatic impairment may require different dosages from patients with healthy hepatic function. What are the side effects of Votrient (Pazopanib)? The most serious side effect of Votrient is hepatotoxicity, which can sometimes be fatal. Signs of an allergic reaction including hives, difficult breathing, or swelling of the face, lips, tongue, or throat will require urgent medical attention. If you notice any of the above side effects, contact your doctor as soon as possible. Regular blood tests are necessary when taking Votrient. Pazopanib has been linked with fatal hepatotoxicity. It is not recommended that pregnant or breast-feeding women taken Votrient. There is a chance of Pazopanib harming the unborn baby and it is not known if Pazopanib is passed through breastmilk. Votrient can interfere with wound healing. Tell your doctor if you are taking any blood thinners. If you require any form of surgery, make sure the doctors are aware that you are taking Votrient.